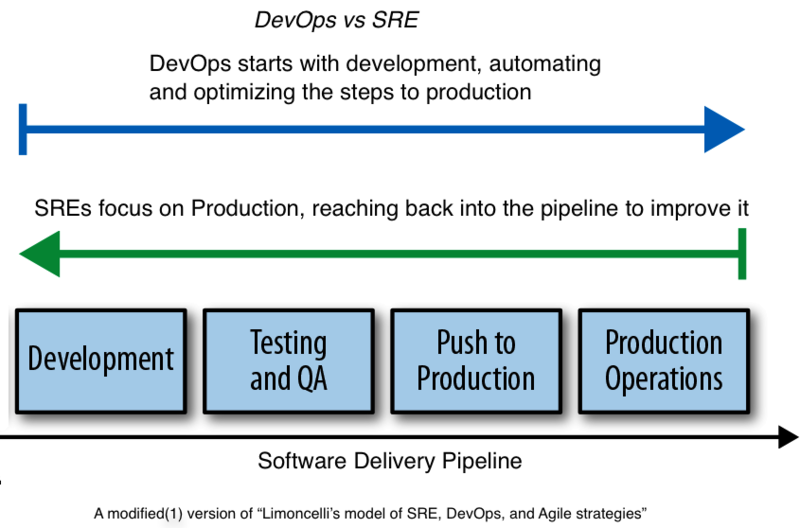 This is illustrated in this diagram, which is a modified(1) version of “Limoncelli model of SRE, DevOps, and Agile strategies”. Both are concerned with the deployment and delivery of an operational site, and both have a heavy focus on collaboration and automation in a culture where learning from failure is championed. DevOps focuses on improving the CI/CD pipeline, from development to delivery by establishing feedback cycles, reducing handoffs and increasing collaboration. SRE is focussed only on the operational infrastructure, and could be considered a silo under strict DevOps philosophy. Also, SRE is a valid job title. Dev Ops Engineer is not (since it is more of a philosophy, methodology, or practice that you follow, similar to Agile). In terms of the difference between Dev Ops and Sys Admin, it is largely one of perspective. Sys Admins are primarily concerns are technical, e.g., is the server up, running, producing errors? An SREs perspective is largely from the user and business perspective. From the SysAdmin point of view, latency growth of a couple of milliseconds might not seem significant, and a large number of errors probably will. An SRE, on the other hand, might be led to an entirely opposite conclusion: an error might happen, but if the end users have not been affected, the service is fine. A negligible latency increase on the other hand may well cause difficulties for customers, and hence be a severe issue. 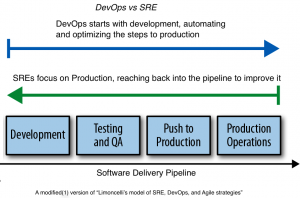 (1) I modified the “Limoncelli model of SRE, DevOps, and Agile strategies” by tweaking the wording to my own liking, and extended the scope of both DevOps and SRE to include the Development phase; I believe DevOps definitely straddles development, and even SREs can be involved with the code too, e.g. to add logging, make the app more observable, improve performance bottlenecks etc.